M.Scott 2 months, 1 week ago. Here is How to install ADB & Fastboot on Linux and MAC if you are more comfortable with Linux or MAC. 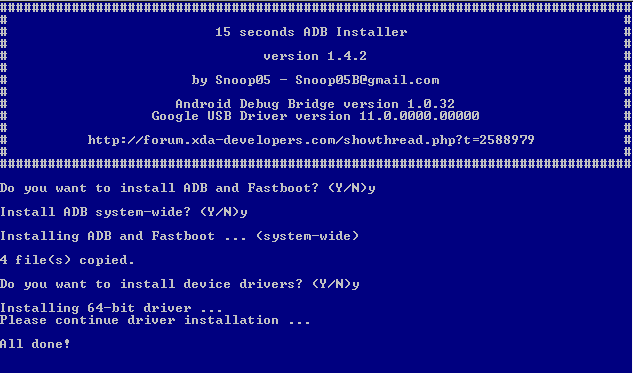 Here I have brought you the One Click ADB and Fasboot Downloads for Windows which is primarily developed by Snoop05. I must say that this a very easy-to-use tool and it’s like plug-n-play installation. As a user you need not to worry and setup anything manually because this utility will be doing everything for you with just One Click. Just press the “Y” key on the keyboard and press Enter to continue. NOTE: This option installs the ADB and Fastboot on Windows PC. Click on Next to continue and when completed just click on Finish button. Once the ADB, Fastboot and Google Android Drivers are installed, the setup Window will automatically be closed. After that you can access the adb and fastboot from the command window on Windows OS. To open the command window, Press Shift + Right Click on mouse on any directory or any place on Windows explorer and then Click on Open command window here. Alternatively you can open the Run window by pressing Windows Key + R on keyboard and then type cmd on the Run command window’s text box and then press Enter. “Path not found”. What should I do? Can you try installing the ADB fastboot executable as an Administrator. – Right click on the EXE file that you have downloaded. – Click on the “Run as Administrator” on the right click menu. See if this works for you?? and let me know. is 2 files the same? enough download one of them? – The LATEST ADB and Fastboot Standalone Download contains the ADB, Fastboot and other supporting libraries. User needs to copy that into a location and set the location to path variable to be accessible from command line window. If you don’t know which one to download, then I will recommend you to download the ADB and Fastboot installer Download Link. Can you run the application with Administrator access? I think that the Windows ADB application requires administrator rights to install. I put this post in ‘Install TWRP’ the other day, got no replies so I’m putting it here now. Guess I should have put it here to begin with. Sorry, I’m new to this forum and don’t know my around very well yet. Instead of installing the one click ADB anf Fastboot, can you just download the LATEST ADB and Fastboot for windows (zip file), then extract the binaries in an easily accessible directory. – Then open the command on Windows and then change directory to the above extracted ADB & Fastboot location. – Execute the adb and fastboot from there and see if you are able to get it to work or not?? This should work. If not, reply back with screenshots like the way did in the last post, I will surely help you out.